The Press of Robert LoMascolo: Aurora Ink open days. . . .
Aurora Ink open days. . . . In honer of the Wells College Book Arts Summer Institute, the Aurora Historical Society will be hosting a special evening viewing of the current exhibit “Aurora Ink! 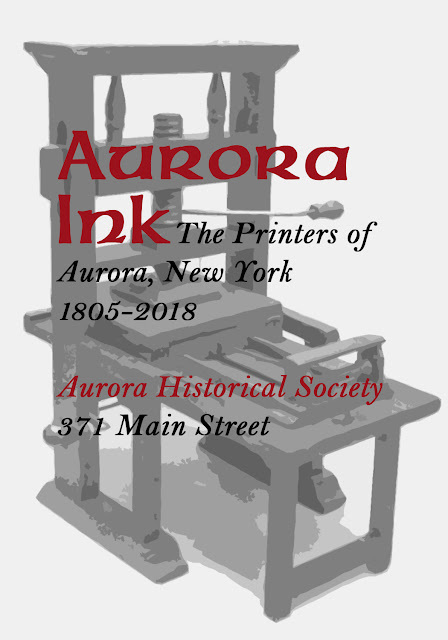 The Printers of Aurora, 1805-2018.” I will have a tabletop press there, and we will be printing from a historic plate! Many knowledgeable and interesting people will be in attendance. Free and open to the public! I will be hosting Summer Institute participants at my studio for informal tours and conversation. It is sure to be interesting. Free and open to all!